Pittsburgh, PA, November 29, 2012 – When asked to describe her holiday wish, Paynter Elementary School student Emma Kraus, age 10, summed it up in one word—peace. And this season, she will have the opportunity to share her wish with others on a holiday card. Emma has been selected as a winner of the 9th Annual Edgar Snyder & Associates "My Holiday Wish" Coloring Contest. As a winner of the contest, her holiday artwork appears on the law firm's holiday card. In addition, she was awarded a $100 gift card. 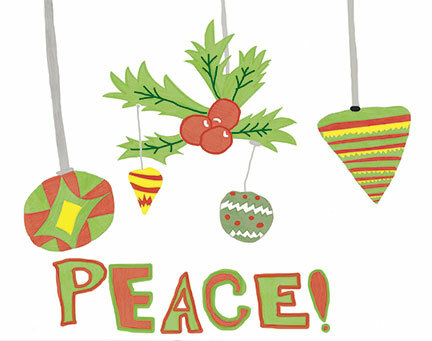 Emma's design features festive mistletoe and colorful ornaments hanging above the word "peace." Janet Cooley, Paynter Elementary's art teacher, surprised Emma with the announcement. "We took her to the office in the morning, not telling her why, and made a live announcement on the intercom with the news," said Mrs. Cooley. "She returned to her classroom and was greeted by applause from her classmates." Emma's eyes lit up when she heard the big announcement. "Fifth grade is my lucky year!" she said. Mrs. Cooley, Emma's art teacher, was just as excited as she was. "My first class told me I was a little ‘off the hook' that day since I was so happy for her!" "I think it is fun for students to enter contests because they anticipate winning and it is a way for them to express themselves through art," Mrs. Cooley continued. "It is also a good lesson for them to learn that it isn't just about luck. It's about how hard work can pay off and that they can feel such a sense of accomplishment when they win." This is the first time that Paynter Elementary has entered the Edgar Snyder & Associates coloring contest. Mrs. Cooley says that her class plans to participate again next year. "I want to thank Edgar Snyder & Associates for helping to promote the art of children through this contest." In addition to Emma, four other students were recognized for their holiday submissions. 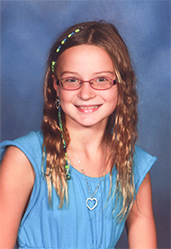 Réka Götz, 9, of Marshall Elementary School in Wexford was the Grand Prize Winner. Edgar Snyder & Associates donated $1,000 to her school and awarded her with a $250 gift card. The three other runners-up were Bryson Huwar, 8, of Clarion-Limestone Elementary in Clarion; Maggie Knisely, 10, of Claysburg-Kimmel Elementary School in Claysburg; and Carter Mates, 6, of Rumbaugh Elementary School in Mt. Pleasant. Each runner-up received a $100 gift card and will have their artwork included on the back of the holiday card.